Movie: "Raiders of the Lost Ark"
Archaeologist Indiana Jones (Harrison Ford) is tapped by the United States government to find the Ark of the Covenant. The Government believes Adolph Hitler is also searching for it, and they want Jones to find it before the Nazis. 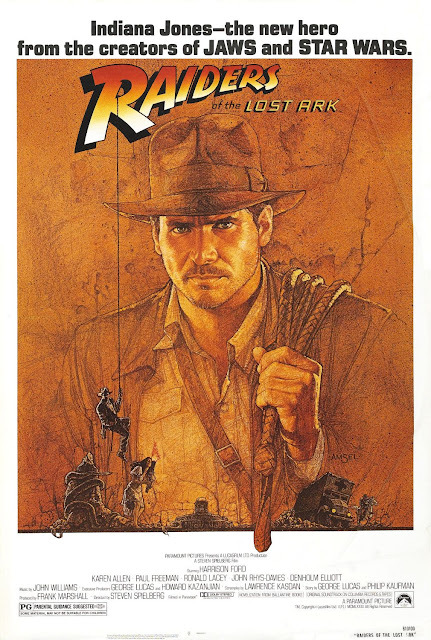 Directed by Steven Spielberg, with a story by George Lucas and Philip Kaufman, and screenplay by Lawrence Kasdan, "Raiders of the Lost Ark" is a fun action adventure about the rugged archaeologist named Indiana Jones, played by wonderful, gruff Harrison Ford. This film is a reminder that there was a time when fun summer blockbusters could get nominated for Academy Awards, a time we wish the Academy could think back upon more frequently as they make their decision for Best Picture each year. This film is the winner of 5 Academy Awards, mostly in the technical department, but it was also nominated for four more, including Best Director and Best Picture, which are highly deserved. Very much an homage to 1930's adventure serials, there are many tributes that run throughout the movie; even Indy's famous fedora is an homage to these older serials. Indiana Jones is a quintessential hero type: he's tough, well traveled, highly educated, quick witted, and women love him. Harrison Ford as Indiana Jones is one of the more well cast characters in all of cinema history. Ford is perfect in the part, though it was a role that almost went to Tom Selleck. If it wasn't for Selleck's previous commitment to "Magnum P.I.," we could have had an entirely different experience with this movie and a vastly changed view of this now iconic character. Ford isn't the only one perfect for his part as there is a great supporting cast of characters, including the incredible Karen Allen, who plays Indy's love interest Marion. Also, there's John Rhys-Davis as Indy's close friend Sallah, Denholm Elliott, who plays Indy's benefactor and museum curator Dr. Marcus Brody, and Paul Freeman, who is great as Indy's rival Dr. René Belloq. When put together, this cast serves up some excellent entertainment in an enjoyable, sometimes scary, sometimes thrilling, sometimes silly movie for the ages. "Raiders of the Lost Ark" is a movie that really has it all. The story is great story, the action is exciting, there are a ton of genuinely funny moments, which provide some great laughs, excellent, well developed characters, exquisite direction, and wonderful camera work combine together to make movie magic. This is one of BigJ's favorite films, one he has watched over and over ever since he was a little kid. Standing the test of time, this is a movie that will be revisited for decades to come by younger generations and serves as a reminder of a simpler, more perfect time when movies didn't have massive amounts of CGI, shoddily written characters, and awful camera work just to turn a profit. We can keep coming back to Indiana Jones and his adventures over and over again and know he'll always be there when we need to watch an amazing, beautifully crafted blockbuster. One year ago, we were watching: "Rachel, Rachel"